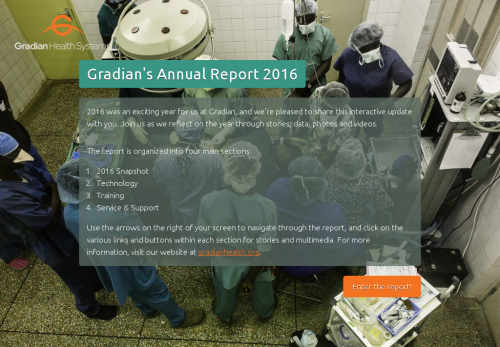 2016 was an exciting year for us at Gradian, and we're pleased to share this interactive update with you. Join us as we reflect on the year through stories, data, photos and videos. Use the arrows on the right of your screen to navigate through the report, and click on the various links and buttons within each section for stories and multimedia. For more information, visit our website at gradianhealth.org.